Advanced Hormone Solutions > Uncategorized > Have You Had Your Thyroid Checked Lately? 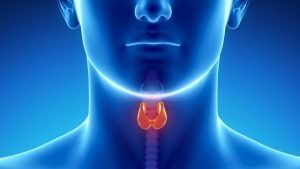 Most men and women know something about aging-related estrogen and testosterone deficiencies, but what about thyroid hormones? The thyroid is also an important part of your endocrine system. In fact, it plays a central role in your health. Its control over metabolism affects nearly every cell and organ in the body. The thyroid also regulates body temperature, growth, muscle strength, appetite, and the health of your heart, brain, kidneys and reproductive system. As you get older, thyroid function begins to slow down. Unfortunately, under-active thyroid (hypothyroidism) is difficult to diagnose. The symptoms are often vague and develop so slowly that many people don’t even know they have it. It was estimated in 2009 that nearly 4.6 percent of our populace aged 12 and up has hypothyroidism. According the American Thyroid Association, more than 12 percent of the U.S. population will develop a thyroid condition during their lifetime. Women are statistically more likely than men to develop hypothyroid and it’s also more widespread in people over age 60. You may have several of these or even none at all. The only way to know for sure is to see a doctor and have your thyroid checked. Since these symptoms can also be related to other health problems, it’s imperative to have a thorough health check to determine what’s going on. You’ll need comprehensive blood tests, including thyroid and other endocrine hormone panels. If you’re over 50, you may find your doctor writing off your complaints as a part of “normal aging.” Find another physician who will take your situation seriously.